Back in 2017 I had just completed California State Route 124 on my way the last Trans-Sierran Highway Pass I had yet to take; CA 49 over Yuba Pass. 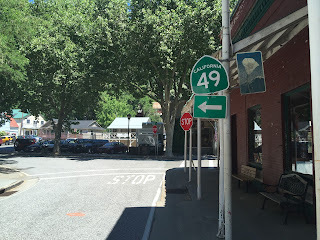 This blog serves as a second part of a series on California State Route 49. The way I reformatted the first entry it should serve with this one as a route guide for CA 49 from CA 41 in Oakhurst all the way north to CA 89 in Sierraville. The first part of the blog series includes the history of each Legislative Route Number ("LRN") that eventually became parts of CA 49. This first entry on CA 49 from CA 41 north to CA 16 can be seen here. From CA 124 I took CA 16 briefly east to CA 49 in Amador County. As noted in Part 1; CA 49 actually begins in Madera County to the south in Oakhurst at CA 41. CA 49 is about 295 miles long and travels most of the traditional 1849 Gold Rush Country north from Oakhurst to CA 70. If you want history and old mining towns then CA 49 is one of the best routes on the West Coast to see both. To the north of CA 16 the next major junction is Signed County Route E16 in Plymouth which is on Shenandoah Road. E16 is a 33.2 mile route which travels northeast to US 50. Plymouth dates back to the 1850s and is mostly known for a winery that dates back to 1856. These photos are from Main Street looking west. North of Plymouth the community of El Dorado is signed 14 miles north on CA 49. CA 49 crosses into El Dorado County while at the Cosumnes River. CA 49 goes through a jump in elevation ascending to El Dorado. El Dorado was apparently called Mud Springs when it was settled in 1849 but it quickly changed to El Dorado in most likely 1855. CA 49 takes an eastern swing on Pleasant Valley Road towards Diamond Springs. Interestingly the photo above displays the original junction of CA 49 and US 50. US 50 came in from Sacramento on the left on Pleasant Valley Road and briefly multiplex CA 49 to Forni Road. US 50 continued northeast to Placervillet. The original alignment of US 50 can be seen on the 1935 California Division of Highways Map of El Dorado County. US 50 seems to have been shifted onto a bypass of El Dorado on Mother Lode Drive by 1938. The original alignment of US Route 50 through El Dorado can be seen on the illustration below. CA 49 continues through Diamond Springs before turning north on Diamond Road towards Placerville. Diamond Springs apparently dates back to 1848 and was named from local springs. Diamond Springs has a couple older buildings along CA 49 as it runs on Pleasant Valley Road. CA 49 cuts north and is signed with a BGS to Placerville. CA 49 crosses Weber Creek and ascends to a high bluff where it enters Placerville on Sacramento Street. CA 49 descends on a 13% grade on Sacramento Street before taking a left turn on Pacific Street and Main Street. Placerville is the County Seat of El Dorado County and is at an elevation of approximately 1,870 feet above sea level. Placerville is located near Coloma and was one of the many mining camps that sprang to life in 1848 following the discovery of Gold at Sutter's Mill in Coloma. Placerville was originally known as Dry Diggins and Hangtown before obtaining it's modern name in the Mid-1850s. Placerville has an extensive downtown area on Main Street full of historic structures. Main Street was the original alignment of US 50 in Placerville. US 50 originally came into the city from the west on Froni Road but that alignment appears to have been shifted in the late 1930s along with the alignment move in El Dorado as noted above. US 50 crossed through downtown Placerville on Main Street and would exit to the east on Broadway. US 50 was present on Main Street until the alignment was shifted to the modern expressway sometime between 1966 and 1976 according to the map views on historicaerials.com. The original alignment of US 50 in Placerville can be observed here on the below illustration. CA 49 briefly multiplexed US 50 on Main Street between Sacramento Street and Spring Street. The alignment of CA 49 is the same today which has resulted at a strange at-grade intersection with the US 50 expressway. CA 49 follows Spring Street before continuing north following a left turn on Coloma Road. CA 49 has a junction with the southern terminus of CA 193 at the edge of the City of Placerville. CA 193 loops north back to CA 49 where it begins an unsigned multiplex. CA 49 begins to descend towards Coloma and the South Fork American River. CA 49 follows the terrain between Placerville and Coloma which means many steep downhill grades. CA 49 junctions CA 153 at Cold Springs Road on the left. CA 153 actually signed on Monument Road and is reputed by the placard to be the shortest state highway at one half mile. 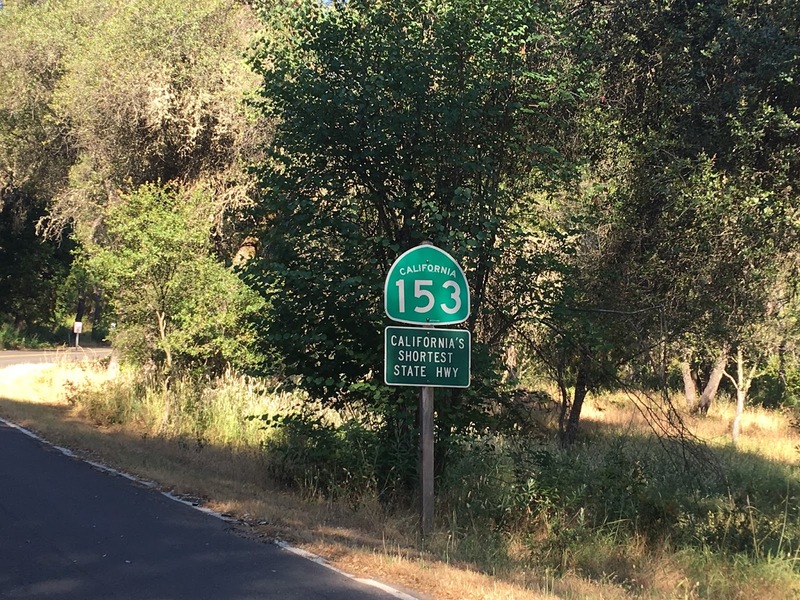 Oddly CA 153 is the shortest state highway but that story can be found here. Coloma is the location of where the California Gold Rush started in following the discover of gold in the waters of the South Fork American River by James Marshall in January of 1848 at Sutter's Mill. Coloma essentially is a ghost town today preserved as part of Marshall Gold Discovery State Park. There are plenty of old building ruins and other various remaining structures in Coloma which can be viewed alongside CA 49. The 1915 Coloma Bridge on Mount Murphy Road crosses the South Fork Sacramento River and provides some nice views from the single-lane truss span. North of Coloma the community of Pilot Hill is signed as 7 miles away. CA 49 crosses the South Fork American River. Seven miles north of Coloma is Pilot Hill. Pilot Hill was founded in 1849 and was originally three communities with the other two called Centerville in addition to Pittsfield. By the mid-1850s all three communities were united under the name Pilot Hill. There isn't much left of Pilot Hill today other than the 1880 Grange Hall. CA 49 meets CA 193 again in Cool. CA 193 multiplexes CA 49 silently north to Interstate 80 in Auburn. Cool has been around since the 1850s but doesn't really resemble a Gold Rush Era town with mostly modern structures. Cool apparently was Stage Stop during the height of the Gold Rush era. 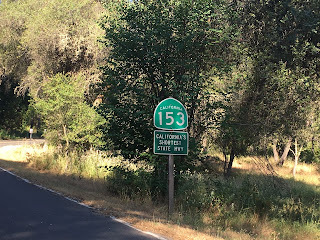 North of Cool CA 49/CA 193 begins to descend into the American River Canyon to the confluence of the Middle Fork and North American Rivers. The Forest Hill Bridge can be seen descending on the 8% downhill grade into the American River Canyon. CA 49/CA 193 crosses the North Fork American River and enters Placer County. CA 49/193 turns left on El Dorado Street and the Auburn State Recreation Area can be accessed on the right via Old Foresthill Road. The Auburn State Recreation Area starts at the confluence of the Middle Fork and North Fork American River. The Auburn State Recreation Area was set aside for the defunct Auburn Dam project which would have flooded the confluence of the Middle Fork and North Fork American Rivers. The Auburn Dam was a concrete arch design that was halted in 1975 following an Earthquake centered in Oroville. The design of the Auburn Dam was deemed to be insufficient to stand up to a large earthquake which largely killed the project. Work on the Auburn Dam foundations resumed down river from the confluence of the Middle Fork and North Fork American Rivers in the late 1970s but the project never regained enough traction to be completed. Part of the Auburn Dam Project was Forest Hill Bridge over the North Fork American River which was intended to be a new alignment of CA 49/CA 193. The Foresthill Bridge was constructed from 1971 to 1973 and has the highest bridge deck in California at 730 feet above the North Fork American River. Had the Auburn Dam project continued CA 49/CA 193 would have crossed the Middle Fork American River on a similar span to the Foresthill Bridge. I've never actually seen a map showing a possible route of CA 49/193 over the South Fork American River Canyon to the Forest Hill Bridge. The illustration below is my best projection of what such a structure might have looked like. Returning to CA 49/CA 193 I found this oddly shaped CA 49 shield. CA 49/CA 193 ascends the American River Canyon on El Dorado Street to the City of Auburn. Originally CA 49 would have met US 40 at Lincoln Way and multiplexed it through downtown crossing the Southern Pacific Rails. CA 49/CA 193 continues on High Street bypassing the downtown section of Lincoln Way. Lincoln Way currently has three sections in Auburn but I believe they were all once one street. I believe at minimum early US 40 would have once used the downtown segment of Lincoln Way but I've never seen proof that CA 49 was ever there. Auburn dates back to 1848 and is the County Seat of Placer County. There are various old buildings all over Auburn but there is a substantial amount of Lincoln Way in downtown. CA 49/CA 193 turns a right on Lincoln Way briefly and passes some Historic US 40 signage. CA 49/CA 193 turns north on Grass Valley Highway towards I-80. CA 193 splits from CA 49 onto I-80 west. CA 49 north of Auburn enters Nevada County as it approaches Grass Valley. CA 49 between Auburn and Grass Valley largely varies between a four-lane to two-lane road is listed as a Caltrans Safety Corridor. In Grass Valley CA 49 is on a freeway alignment so I took the original alignment on Auburn Street. Despite Auburn Street not being the present alignment of CA 49 there is still plenty of directional signage for CA 49, CA 20, and even CA 174. The modern CA 49 freeway can be seen ahead on northbound Auburn Street in the first picture. At Main Street CA 49 northbound would have taken a right turn and multiplexed CA 20. Specifically CA 20 would have come in to meet CA 49 in Grass Valley via the Rough and Ready Highway at the intersection of Main Street and Auburn Street. CA 20 would have multiplexed CA 49 all the way to Nevada City where it continued over Sacramento Street onto Nevada Street. An unsigned segment of Legislative Route Number 25 would have met CA 20 and CA 49 in Grass Valley at Bennett Street. The unsigned segment of LRN 25 became was designated as CA 174 during the 1964 California Highway renumbering. The modern freeway alignment of CA 20/49 can be seen in development from 1966 to 1969 State Highway Maps. CA 20 seems to have been realigned off the Rough and Ready Highway to the south to meet CA 49 at Empire Street sometime between 1982 and 1986. All applicable map references can be seen below in addition to the 1935 California Division of Highways Map showing the original alignment of CA 49, CA 20, and LRN 25 in Grass Valley through Nevada City. The original alignments of CA 49 and CA 20 through Grass Valley can be seen on the below illustration. Grass Valley is the largest community in Nevada County and apparently had Post Office Service all the way back to 1851. Reportedly Grass Valley was called Boston Ravine and Centerville before assuming the current name. Grass Valley is located at approximately 2,400 feet above sea in the Sierra Foothills and really is the gateway towards the rise above Yuba Pass. The largest mine in Grass Valley was the Empire Mine which is located on Empire Street and is now the main feature of Empire Mine State Historic Park. The Empire Mine opened in 1850 after gold bearing quartz was found near Grass Valley. Much of early mining activity in California used Placer methods but the hard rock surface around Grass Valley made that impractical. Hard rock mining methods were used at the very beginning of the Empire Mine up until it's closure in 1956. The State Park has many well preserved structures from the history of the Empire Mine such as the Empire Cottage from 1897 built for William Bourn Jr.. The Empire Mine was not very profitable until 1869 when it was acquired by William Bourn Sr. William Bourn Sr. died in 1874 and management of the Empire Mine eventually fell to his son William Bourn Jr. in 1879. The 1905 Empire Clubhouse stands directly south of the 1897 Bourn Cottage. Ahead is the remains of the Empire Mine Stamp Mill which once had 80 stamps. Gold was retrieved from the smashed ore via use of mercury which used to cover stamp tables. The building ahead was constructed in 1898 to house the Mine Manager's Office, Assay Office, rescue station, and a refining room. The metal building ahead is the 1886 Empire Mine Machine Shop. Access to the Main Empire Shaft is located at the back of the Machine Shop. The Main Shaft was traversed approximately 4,600 feet via use of ore cart which doubled as transport for the miners. The Compressor Building ahead pumped oxygen into the Empire Mine. The Empire Mine visitor center has various mineral samples locally sourced and from other mining districts. From Grass Valley I continued on the original alignment of CA 49/CA 20 east on Main Street towards a roundabout. CA 49/CA 20 continued ahead through the roundabout on Nevada City Highway towards Nevada City. CA 49/CA 20 originally used Zion Street and Sacramento Street as it entered Nevada City. CA 20 would have split eastward at Nevada Street while CA 49 northbound would have turned on Broad Street into downtown Nevada City. Today Broad Street crosses over the CA 49/20 freeway as it enters downtown Nevada City. Nevada City is the County Seat of Nevada County and dates back to 1849. Nevada City was settled on Deer Creek and apparently was one of the largest gold producers in California in the early 1850s. Apparently Nevada City was originally called "Nevada" and the "City" part was added in the 1864 to avoid confusion with the recently State of the same name. There is an old road in Nevada City called Old Downieville Highway but I don't believe that it was ever part of CA 49. The 1935 Nevada County Map cited above seems to show the original alignment of CA 49 continuing on Broad Street through Nevada City to the modern highway. The illustration below shows the original alignments of CA 49 and CA 20 in Nevada City. North of Nevada City CA 49 becomes extremely rural as it climbs higher into the Sierras. Modern CA 49 largely aligned on the north bank of the Rush Creek descending down to the South Fork Yuba River. The 1935 Nevada County Highway Map seems to indicate that CA 49 crossed Rush Creek at an alignment I can't locate and rejoined the modern highway possibly using Jones Bar Road. The modern alignment of CA 49 descends a 7% grade to the South Fork Yuba River. At the South Yuba River there is an older concrete rainbow arch design bridge from 1921 that was used as part of CA 49 until 1993. The 1921 bridge is officially known as the "Hoyt Crossing Bridge" and is the trailhead for many hiking paths branching away from the South Yuba River Canyon within South Yuba River State Park. There was actually a news crew present on top of the 1921 bridge talking to county officials about river safety. Suffice to say the modern crossing of the South Yuba River is substantially wider than the 1921 bridge. CA 49 northbound rises out of the South Yuba River Canyon, the next major community of interest is North San Juan. North San Juan dates back to the 1850s and was named by a veteran of the Mexican-American War. Apparently North San Juan has connections to the hydraulic mine district that is now part of Malakoff Diggins State Park off to the east. There isn't much left of North San Juan today aside from a couple buildings which would have been part of a downtown district. North of North San Juan the community of Camptonville is signed as 8 miles away and Downieville is signed at 29 miles away. CA 49 crosses the Middle Fork Yuba River into Yuba County. Near Camptonville CA 49 has a junction with Signed County Route E20 at Marysville Road. CR E20 heads west for about 20 miles to CR E21. CA 49 bypasses Camptonville and never appears to have entered the community during the Signed State Highway era. Camptonville was around back in the 1850s and was a north terminus of one of the legs of Henness Pass Road. The Henness Pass Road was a wagon toll road developed in the early 1850s but largely was replaced by the late 1860s when rail freight became more developed in California. CA 49 appears to have a routing nearly the same as it was all the way back in 1935 within Yuba County which an be seen looking at the California Divisions of Highway Map from said year. North of Camptonville CA 49 enters Sierra County quickly crosses the North Fork Yuba River. CA 49 follows the North Fork Yuba River along the north bank to Downieville. There is a large overlook on a bluff above Downieville which is a great place to see the entire community. The overlook includes a 1874 Topographical Map of Sierra County. Despite not being an incorporated place Downieville is the County Seat of Sierra County. Downieville is located at the junction of the Downie River and North Fork Yuba River at about 3,000 feet above sea level. The current population of Downieville was slightly less than 300 residents on the 2010 Census. 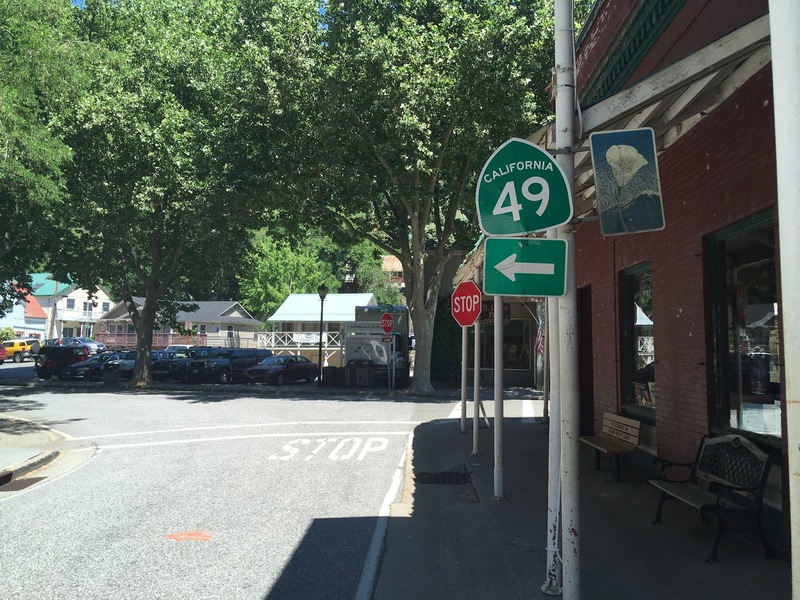 CA 49 becomes a one-lane highway in downtown Downieville. CA 49 turns right over the Downie River while Legislative Route 36/CA 194 would have began at Main Street. Looking ahead at Main Street which was the beginning of LRN 36/CA 194. LRN 36 was adopted as a state highway all the way back in 1907 which terminated at Saddleback Mountain north of Downieville. LRN 36 meant to serve mining interests north of Downieville and surprisingly survived the California Highway renumbering to briefly become CA 194. CA 194 only lasted one year and was decomissioned in 1965, the route was likely never signed. CAhighways.org has a extended piece on the history of LRN 36/CA 194 and maps from 1964 in addition to 1966 show the relinquishment of the highway. The 1935 California Division of Highways Map of Sierra County shows the full length of LRN 36 from Downieville to Saddleback Mountain. CA 49 crosses the Downie River on the 1938 Jersey Bridge. The Jersey Bridge is one of the more unique highway bridges being a single-lane span. There is some nice views of the Downie River and of an old Scenic placard with an accompanying CA 49 shield on the north bank. CA 49 is one of the few state highways with a remaining one-lane segment, others would include; CA 4, CA 146, CA 35, CA 36, CA 168, and CA 172. Downieville is one of the more fascinating Gold Rush era town sites. Downievile dates back to 1849 when gold was found at the confluence of the North Fork Yuba River and Downie River which led to mining claims in the mountains to the north. Downieville was originally called The Forks before renamed after William Downie who apparently had a hand in founding the community. Downieville was one of fifteen communities in contention to replace Vallejo as the state capital in 1853 but ultimately the remote location in the Sierras didn't help it's cause. Downieville apparently had a population as high as 5,000 during the Gold Rush Era which dropped off sharply at the end of the peak mining days. Sierra County continued to decline in importance in the early 20th century and has less than 3,500 residents in modern times. After crossing the Downie River CA 49 continues to follow the North Fork Yuba River to Sierra City. Sierra City is at an approximate elevation of 4,150 feet and is the last major community before Yuba Pass and CA 89. Sierra City dates back to 1850 but was abandoned for several years after the town was destroyed in an avalanche in the winter of 1852-1853. The mines of Sierra City were apparently on both banks of the North Fork Yuba and I'm to understand placer mining still takes place in the community today. After passing through Sierra City CA 49 begins to ascend rapidly to Yuba Pass. There is a small community at the junction of Gold Lake Highway called Bassetts which apparently dates back at least to the 1870s. Unlike most of the Trans-Sierra Passes the road over Yuba Pass is somewhat shallow near the peak on both flanks of the Sierras. The grade isn't a difficult climb up to 6,000 feet above sea level. Yuba Pass is at 6,701 feet which can be seen from this placard. The eastern descent from Yuba Pass to CA 89 has a shallow grade of only 5%. Most of the passes through the Sierras have a much sharper drop on the eastern flank of the range than from the west. CA 49 descending Yuba Pass was heavily damaged but it wasn't much of an issue due to a total lack of on-coming vehicles. There was an overlook of the valley below but it was partially overgrown which led to an obstructed vista. After descending Yuba Pass CA 49 meets CA 89. CA 49 and CA 89 have a wrong way concurrency. CA 49 North is multiplexed with CA 89 South to Sierraville. Sattley is only 1 mile east of the start of the CA 49/CA 89 concurrency and Sierraville is 5 miles away. CA 49/CA 89 has a junction in Sattley with West Side Road which is signed as "To" route for Signed County Route A23. CR A23 loops back to CA 89 just 13 miles to the north. Sattley itself was founded in the 1880s after the heyday of the Gold Rush Era and there isn't a ton to see in the community. The road between Sattley and Sierraville opens up into a wide vista. In Sierraville CA 89 splits south towards Truckee and Lake Tahoe while CA 49 continues straight to Loyalton. When I took this photo I was headed south on CA 89 towards Lake Tahoe. Surprisingly there isn't much literature online about Sierraville but the buildings make it obvious it is from the Gold Rush Era. Sierraville was on this 1873 map of California that I found. What makes Sierraville really interesting in the context of CA 49 is that there was a chance it was the north terminus of the highway at one point. As noted in Part 1; after the Signed State Route program began in 1934 there was several state highways that were actually signed on non-state maintained roadways. CA 49 from Sierraville over the Plumas County line to CA 24 (modern CA 70) was actually originally signed on County Maintained roadways which can be seen on the 1938 State Highway Map, The Sierra County Highway Map from 1935 above, and the Plumas County Map by the California Division of Highways in 1935 below. By 1940 CA 49 is not shown existing between Sierraville and CA 24. It appears that all State Highway signage on County Maintained roadways was removed by 1940. CA 180 and CA 33 were also on County Maintained roadways on the 1938 map but also are not shown on the 1940 map. By 1954 a proposed new road known as LRN 233 is shown between Sierraville and CA 24 appears on the state highway map. By 1958 the previous county roads between Sierraville to CA 24 officially became State Maintained and part of CA 49 once again. LRN 233 and the new alignment it would have used seem to have been completely abandoned in the planning stages. CA 24 through the Feather River Canyon to US 395 was also redesignated as US 40A by 1958. Had the 1954 alignment of LRN 233 been actually built this is what CA 49 might look like today. So the question in regards to Sierraville remains open; from 1940 to 1958 did CA 49 end at CA 89 coming down from Yuba Pass or did it end in Sierraville? The only evidence that I've seem seems to suggest Yuba Pass as a 1957 topographical map on historicaerials showing CA 49 ending there as opposed to Sierraville. In regards to CA 49 north of Sierraville. If plans hold true I'll be driving said section to CA 70 near Vinton at some point in August 2018 on the way to Boise. Once I finish the last segment of CA 49 I will create a Part 3 to this blog series.